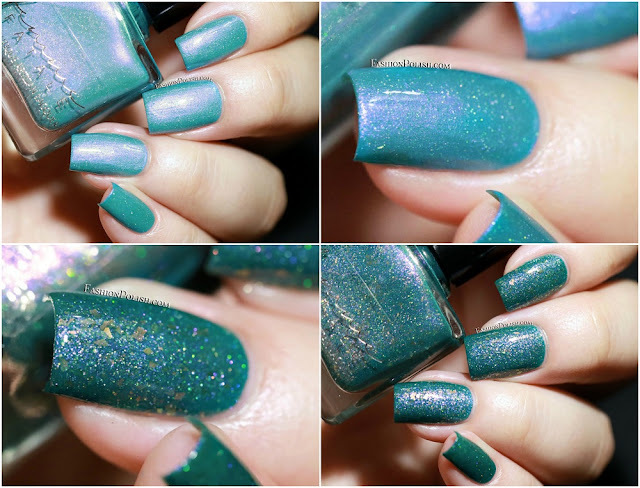 I have the latest Beauty So Fly exclusive Femme Fatales to share with you today! Femme Fatale manages to create astounding shimmers that exude depth and complexity like no other so let's give these a closer look! Sky Mirror is a turquoise crelly infused with a contrasting violet shimmer and scattered with sparkling holographic microglitters. I usually love violet shimmers but I have to say that this one's a true beauty. Flawless application and a 2 coats coverage (plus topcoat) in my swatches below. The Third Moon is a deep teal complemented with a strong violet shimmer as well as a cluster of red-shifting flakies. This one has a definitive wow factor, it was instant love! Again, perfection upon first stroke. I used 2 easy coats plus topcoat in my swatches. Femme Fatale Sky Mirror and The Third Moon will be available this Friday 8/26 at 9PM Singapore time (9AM EST / 1PM GMT) exclusively on BeautySoFly.com.